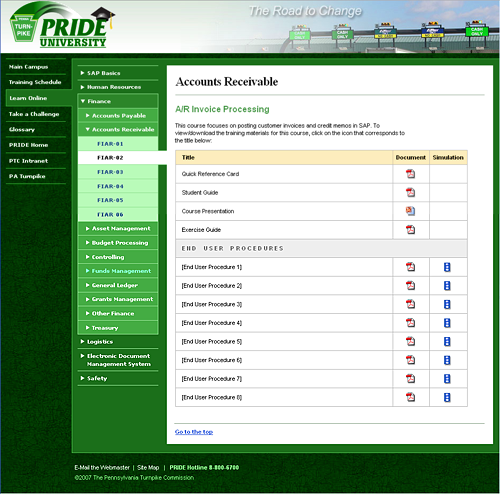 Extensibility – Because training requirements likely to grow over a long period, the site needed to be able to expand without a redesign or a horizontal scroll. To meet this requirement, I created an information architecture and visual design that accommodated content expansion, despite the PTC frequent use of 800 pixel screen resolution. Intuitive Navigation – Because the PTC included a large user base with limited application skills, it was important the information architecture to be presented in a manner that was easy to understand. In terms of site navigation. Working with the Training Team, I utilized taxonomies understandable to the users and created a navigation scheme with clear affordances for current location and the desired path to information. Modular Construction – It was a given the training curriculum would need to be adjusted. As such, the site information architecture needed to be agile. Working with the site's Dot Net developer, I ensured the site's IA worked with a modular code design. 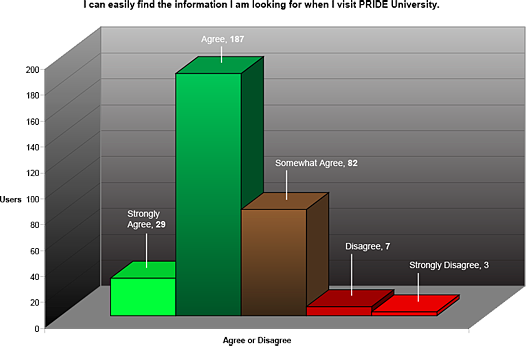 After the first round of SAP training, I conducted a Likert scale survey of 303 PRIDE University users. The results showed that a strong majority of users felt that they could easily find the information they sought.